Dr. Allen Gabriel, MD is a Doctor primarily located in Vancouver, WA. He has 18 years of experience. His specialties include Plastic Surgery and Surgery. He speaks English. Dr. Gabriel has received 7 awards. The overall average patient rating of Dr. Allen Gabriel is Excellent. Dr. Allen Gabriel has been rated by 141 patients. From those 141 patients 63 of those left a comment along with their rating. The overall rating for Dr. Allen Gabriel is 4.9 of 5.0 stars. I love the staff and the entire experience has been AMAZING!! Dr Gabriel is one of the best doctors with the most professional but caring like family feel!! Cant wait for more work!! This by far has been the most amazing experience! While I had to battle with insurance to cover the breast reduction, Dr. Gabriel and his staff stuck with me and saw it through. He kept telling me he was determined that we would win this battle and we did! Now 2 weeks post surgery and I couldn't be happier with my results. Dr. Gabriel has the sweetest demeanor and spends as much time as needed to answer my multiple questions. I am so thankful to have had someone so experienced and caring to take care of me and that truly desires to have his patients be happy with the results. Thank you Dr. Gabriel and your amazing staff for making my dreams come true! I am at 7 weeks PO breast augmentation and I feel great. I had very little pain first 3 days and after that i've been having just zingers here and there that lasted for a few seconds. Dr Gabriel is an amazing surgeon and if I were to do it again, I would in a flash. I am very happy with the work he did, the size is perfect for my body frame and my confidence went up. Great team to work with. Dr. Gabriel is best in town. His attention to detail is precise. Bed side manners are professional, gentle, caring and knowledgeable. He takes time to answer all questions and never rushes through patients. Takes the time with each patient, very accommodating. He earned my trust, and loyalty. Five stars for the team. 2000-2001: Medical Student Research Fellowship "Effect of Hyperbaric Oxygen on Ischemia-Reperfusion Induced PMN CD18 Polarization." Advisor: William A. Zamboni, M.D. Microsurgery and Hyperbaric Laboratory. Division of Plastic Surgery. University of Nevada School of Medicine. Las Vegas, NV. 1999-2000: Summer Research Fellowship "Effect of L-Arginine on Leukocyte Function in Ischemia-Reperfusion Skeletal Muscle-Microcirculation." Advisor: William A. Zamboni, M.D. Microsurgery and Hyperbaric Laboratory. Division of Plastic Surgery. University of Nevada School of Medicine. Las Vegas, NV. 1998-1999: Summer Research Fellowship "Effect of Total Venous Occlusion on Capillary Flow and Necrosis in Skeletal Muscle." Advisor: William A. Zamboni, M.D. Microsurgery and Hyperbaric Laboratory. Division of Plastic Surgery. University of Nevada School of Medicine. Las Vegas, NV. 1995-1996: Diabetes Research Fellowship "Expression of Glut-1 transporter." Advisor: Faramarz Ismail-Beigi, M.D., Ph.D. Division of Clinical and Molecular Endocrinology. Case Western Reserve University School of Medicine. Cleveland, OH. 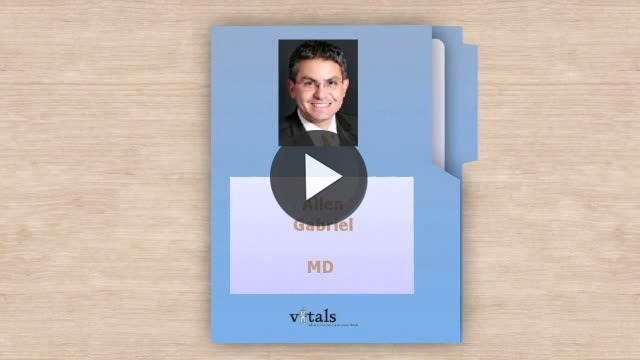 Take a minute to learn about Dr. Allen Gabriel, MD - Plastic Surgery in Vancouver, WA, in this video. Dr. Allen Gabriel is similar to the following 4 Doctors near Vancouver, WA. Have you had a recent visit with Dr. Allen Gabriel? Select a star to let us know how it was.